The Wheel-Argument is a consideration about a hierarchical order between suits, as it might have been intended by early card makers. The conjectured context is unproven, and there is doubt raised by an established opinion in playing card research, which also proposes a "good argument", but from another direction, which in this special case - my opinion - is not reliable. The reason for this is logical: Italian espadone or spadone and English spades "MUST" be relatable, cause it sounds similar - normally, but .... Spades in English means "Spaten" in German and German card language knows the expression "Schippen" for suit Pique, too. Schippen is low German for "Schüppe", and a Schüppe is a similar tool as a Spaten, and both have in common, that they also look a little bit like a "pique"-sign (the nowadays difference between Spaten and Schüppe is, that the digging part of Spaten is rectangular, useful for digging, and only a Schüppe might look like a pique-sign - the Schüppe is used for loose material, for instance sand; the older meaning for Spaten might be different). Italian "Spada", however, means a "sword", and a sword in no way looks similar to a pique-sign in card play. Early playing cards in England were imported from France, not from Italia, the English word Spades should have developed from the optical perception of the French suit, not from a word used in Italia. English language resisted the French word Pique, why should it have taken the Italian "Spada"? France is near to England, Italy is far. The French suit-system is very near to the German suit-system, and the assumption, that the French designers were more oriented towards the German system might be reliable. Generally the German playing card development was earlier than that in France, Germany being probably dominant in the early years of production. The Mantegna-painter once had (probably) a special view at the correct arrangement of the suits, possibly also the inventer of the French suits signs, and a lot of actual card-plays seem to mirror their opinion correctly, just by using the "Wheel" (the Wheel is a term, that I invented myself - what it is, you might learn below). Only the Spadone-Spades equation contradicts. It's correct, that Spades are Pique, but it is incorrect to assume, that Spades or German Schippen or Pique derived from Italian Spada, Spadone or espadone. It just developed cause an English "spade" looks like a sign in a French suit-system. and gives the argument for the change from E to S, that Espadone is only Venetian dialect and that the common word for swords had been Spadone. The argument looks solide and in our considerations we assume it as "correct". The historical contexts of the socalled Mantegna-Tarocchi and the ABCDEI in Ferrara is near to each other. The Mantegna-Tarocchi is calculated as being produced by an unknown artist around 1465 or little later, the picture at Palazzo Schifanoia probably was done 1469 - 1472. Francesco Cossa left Ferrara in 1472 and the first 3 monthes are attributed to him, so also the month April. For the Mantegna-Tarocchi a Ferrarese-Venetian origin is assumed, so the ABCDEI doesn't appear to be accidently just at this place. Interestingly in 1468 Ferrara was visited by Emperor Fredrick III., who was rather occupied by signing lots of documents, by which lots of Italians got remarkable titles and Emperor Fredrick a lot of money. Fredrick III. is known for developing a special motto, AEIOU, which is noted by him in a private notebook already in 1437, already in a time, when he was not emperor (click the image for more information). The motto was excessively used by him in heraldic devices. Fredrick III. is known to have been a little obsessed with esoterical ideas, also around the motto. 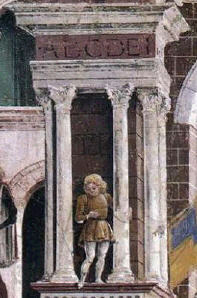 His attitude couldn't have stayed hidden in Ferrara, and the ABCDEI at the picture in Palazzo Schifanoia must be probably be seen in the context of Fredricks visit. Another background of the ABCDEI is the fact, that the printing press has reached the region just in this time and that the alphabet (naturally a major thinking object at this time) was associated with Jews as possible inventers of the alphabet. The Month of April shows at another detail the run of the Jews , just below the ABCDEI (which probably could be interpreted as ABC Dei meaning "ABC of God"). in the opinion of the Mantegna creator. With that plausible conjecture it's time to observe the Wheel-Argument. Not all card-plays, which are known today, do use hierachies between the suits inside its rules, but some do, like Bridge, Skat, Doppelkopf. Nearly all card-plays with that quality only use one wheel with 4 different hierarchies (I found only one game, Preference, which uses another of the 5 possible wheels; however, my researches were not very consequent and there might be more - further research might be necessary to strengthen this argument). One should assume, that this "wheel" was already object to the earliest card-players and perhaps took influence on the creator of the 5x14-deck illustrated by Bembo. Why should one associate the Pope with swords? The Pope presents the Holy Cross, a cross is rather similar to a sword. The baton of the Emperor is his scepter. Cups are traditionally attributed to love and women, so the Empress must present cups. Coins belong to the Papessa ... with (from the optical impression) no understandable reason, but it's the only position, which is left free. The reason for it is probably, that the 4 suits were invented from the Mamelucks in Egyptia, but Emperor, Empress, Pope and Papessa entered the card-plays in Italy more than 100 years later and Papessa was probably chosen for symmetrie as the missing 4th person for the older trio Emperor-Empress-Pope (compare the article about the Cary-Yale)..
Where does the wheel come from? With some phantasy it's already in the suits, in Italian and French suits. A sword has three ends. Spades reminds a pike (Pique is the French name), a weapon with two ends. The Italians got their suits (probably) from the Mamelucks, so they took no direct influence on any incorporated number-idea. The Mamelucks had polo-sticks instead of batons; polo-sticks could also have been associated with the number 2. The Brera-Brambilla and the Cary-Yale Trionfi used arrows instead of batons (arrows could be also interpreted as the number 2). The French suits developed (probably) around 1480. If there was any current hierarchy between the suits known at that time, they might have transformed it into a new, but similar number-idea. Many other suit-systems of the early time in playing card history doesn't show any number-idea (there were Swiss suits, German suits, flowers, animals, birds, shields, many different ideas). However, a painted hierarchy between 4 suits was already known from early chinese cards; they used coins, strings of coins, greater string of coins, greatest strings of coins as suits (compare here), following by this a similar number-idea as the Hebrew and Greeks by their connections between alphabet- and number-system (1-9, 10-90, 100-900). It is displayed for instance also in the Mah-Jongg-Game with its 3 suits (1-9) coins, bamboo-sticks and numbers (the Mah-Jongg is said to be off younger origin, but it contains older order-elements). It's just a logical idea to paint the intended hierarchy on the cards, and it might be, that it was a living idea in 15th century in Italy and France and it took strong influence on card playing in Europe (rules of the actual games).